I know I'm about half a month late with this post, but can we just ignore that part? Things have been very busy and time seems to have flown past even quicker than usual. If you're wondering where I've been for the past few weeks, go have a read at Thursday's post here. This month features mostly skincare products and I think I've finally found a "new" groove with my skincare routine. Let me know in the comments section if you'd like to see an updated skincare routine post? 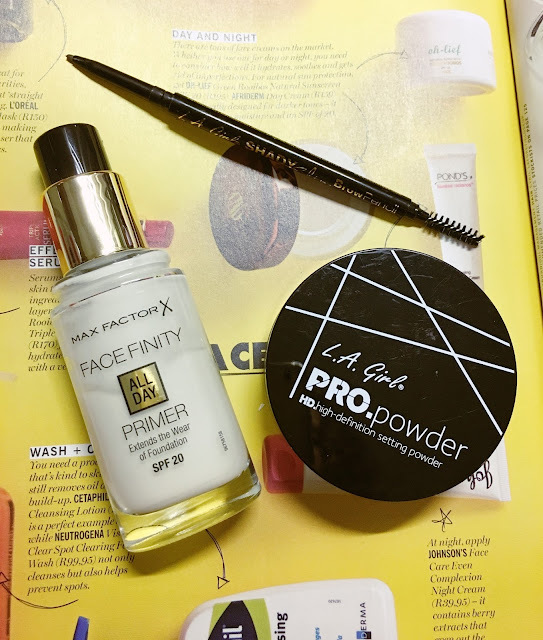 I've had the Max Factor Face Finity All Day Primer for a while, but I've only started using it regularly this past month. The primer is fragrance-free and white, but the consistency is different to other primers. It's not runny, nor is it thick, it also doesn't feel particularly creamy, but it's definitely not silicone-ey like the Maybelline Baby Skin. It applies easily to the skin and I've tried it under many different BB creams and foundations without noticing any pilling. The primer forms the perfect base and BB cream and foundation glide on over it. It contains SPF 20, which is a bonus. What would a favourites post be without at least one L.A. Girl product? This past month I have been loving the finely-milled translucent (loose) powder to set my oily T-zone. My newest eyebrow obsession is the Shady Slim Brow Pencil in the shade "Brunette". I believe this product was around R80 and the shade selection is excellent. It has a skinny pencil on the one side (not too waxy, not too pigmented), and a spoolie on the other side. I recently did a post about the Neutrogena Hydro Boost range (you can read it here). I've been enjoying all the products in the range, but the two standout products have been the Micellar Water Cleanser and the Water Gel Cleanser. The Micellar water struggles to remove my (sometimes waterproof) mascara, but apart from that it cleanses my skin beautifully and leaves it feeling nourished, not dry and tight like some other micellar waters and makeup removers can do. The water gel cleanser produces a rich lather and my skin is again left feeling hydrated and supple, which is no mean feat. Both products also have a pleasant fresh scent, and the prices are extremely affordable (less than R100 each and mostly on 3-for-2 at Clicks or 20% off at Dischem). Eye creams are, to me, a bit of a gimmick as I don't tend to ever see results, no matter which type of eye cream I use. That being said, I do feel that my eye-area can benefit from a bit of moisture, even if I don't see the results. The Body Shop Drops of Youth Youth Eye Concentrate comes in very interesting packaging. You press the flat side lightly and then the product is dispensed around the roller ball. It's very cooling and soothing, and, although I can't vouch for this reducing my wrinkles, it definitely de-puffs my eyes in the morning. There's no stinging and no breakouts, just hydration. 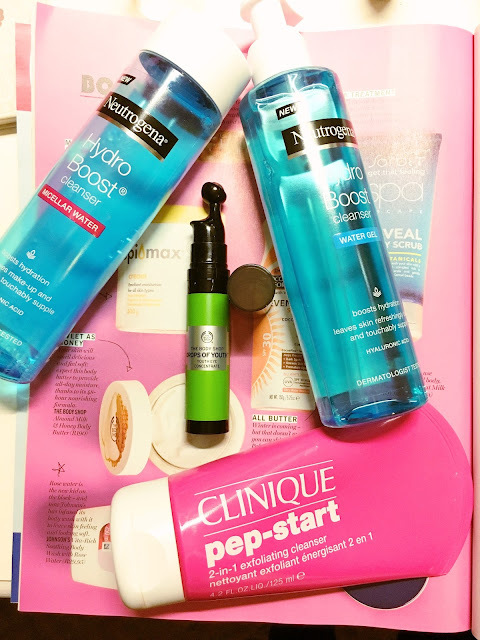 I have been eyeing the new Clinique range and finally settled on the Clinique Pep-start 2-in-1 exfoliating cleanser. I've been using this every morning in the shower and I'm hooked. It reminds me of their 7 Day Scrub Cream, but a little less gritty and harsh. My skin feels clean and exfoliated without being overly red or sensitive. This is also gentle enough to use everyday, although I won't recommend that people with sensitive skins use this more than twice to three times a week. And there you have it, my favourites for the month of April! What were your favourites this past month? Let me know in the comments section.